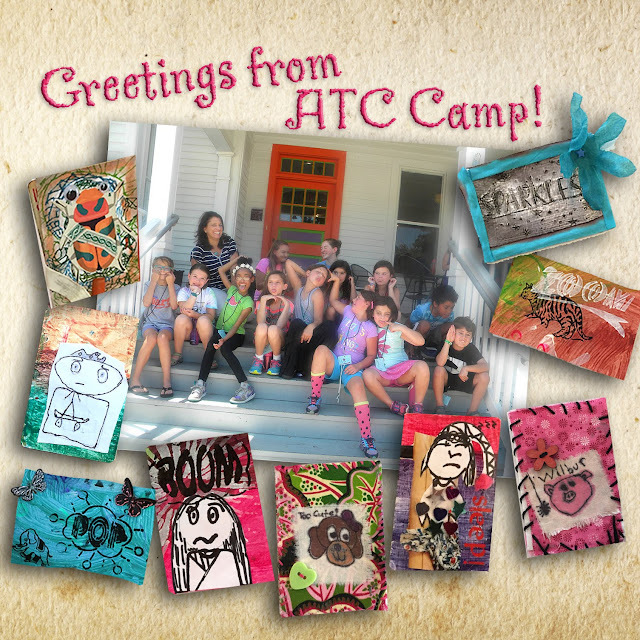 StencilGirl Talk: Greetings from ATC Camp! 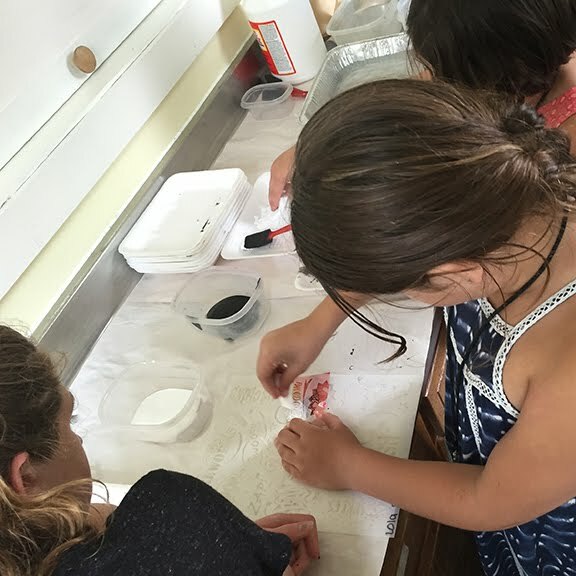 This summer I taught a week long ATC (Artist Trading Card) camp for ages 8 through 11. It was the perfect camp for kids since most are familiar with or have collected some type of trading card like baseball or football, Pokémon or the hundreds of others that have a special place at Target tending to drain a wallet very fast. Backing up, if you’re not familiar, ATCs are 2-1/2” x 3-1/2” works of original art. They can be made from any media including paper, fabric and even metal. 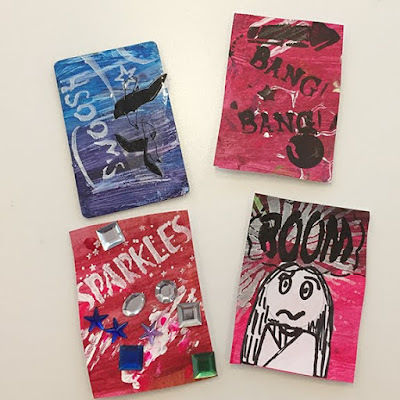 In my camp, we made ATCs from all three as you can see in the samples above surrounding our camp picture! (note: It may not look like it, but I have everything completely under control. 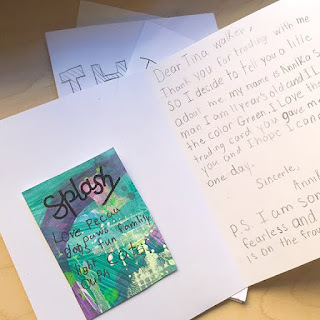 I swear : ) ATCs are meant to promote a sense of sharing and community among other artists and they certainly did all that and more during our week-long adventure. The tiny format allows for high productivity and the chance to learn and experiment with lots of new techniques. On the first day of camp, every camper was presented with their very own binder complete with card sleeves which they had no problem filling very quickly. To begin, we focused on line by creating a series of zen doodle cards (above). Each day brought new lessons with additional concentration on color, pattern, texture and finally interactive art. The kids learned the power of combining one technique with another in true mixed-media style. Of courseit was my duty to make sure they were introduced to the wonderful world of stencils. 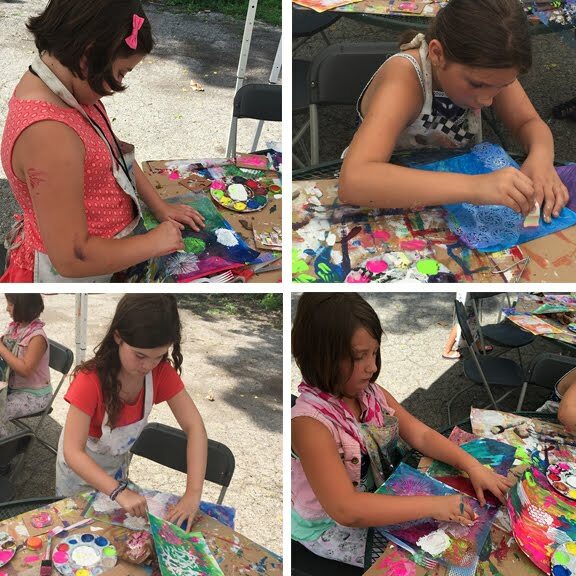 We spent a fabulous messy morning outside with my stencil collection and a big surprise from Mary Beth as each child was presented with their very own stencil! I taught them how to stencil properly by using kid-friendly cosmetic sponges for nice crisp results. Of course there was a learning curve…less paint works better, pounce up and down, not side-to-side, and stay away from the water bowl! Here the campers created cardstock papers they cut to ATC card size when dry. This patterned cardstock made for the perfect ATC backgrounds. I totally relate to the girl with the big “BOOM” over her head! I also love how this camper used another stencil behind the word to emphasis the brain explosion! Genius! On the last day I had another BIG surprise for my campers. 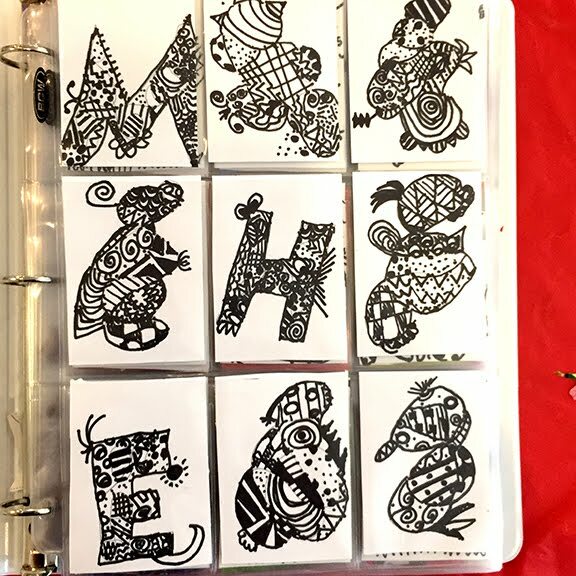 Several artists from StencilGirl including the Stencil Girl herself, Mary Beth Shaw (her two cards are pictured bottom, right), had made cards to trade with my campers. Special thanks to Gwen Lafleur, Cindy Gilstrap, Tina Walker, Anna Friesen and Mary Beth Shaw for making cards and mailing to me so I could arrange the trades. These Ohio kids were soooo excited to trade with famous artists from all over the United States and Canada. I can not even begin describe the excitement in the room as each child blindly chose an envelope with a SG artist trade inside. Then they picked a card they made to trade with their SG artist friend and wrote a thank you note to insert the card into. One little boy, was firm all week that he did NOT want to trade with anyone: myself, other campers, Picasso, etc. because he loved his cards so much. I told him that was fine, but I couldn't give him a Stencil Girl trade if he didn't trade in return. This camper held out until he started seeing the excitement the other kids experienced from trading. Finally, he pulled out the least favorite card he had made (LOL) and said “I want to trade.” When he opened the Stencil Girl ATC he lit up. He just sat in his seat touching the card’s texture and smiling. He carefully put it into his ATC binder and right then decided trading made him happy. He went on to trade with me and all his camper friends. A gate was opened and I couldn't stop smiling at what I had just witnessed. It touched me by how deeply these kids were moved by the experience of trading their special art with adult artists and then with each other. Art + community = powerful stuff no matter how old you are. Finally, here’s a peek at several student displays set out for parents and special visitors on the last day of camp. 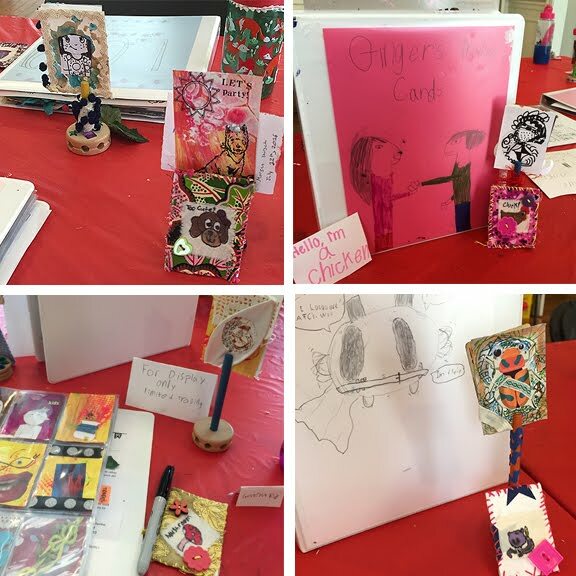 The campers displayed a few of the ATCS they were most proud of and left their binders out to be paged through. It was an amazing week. 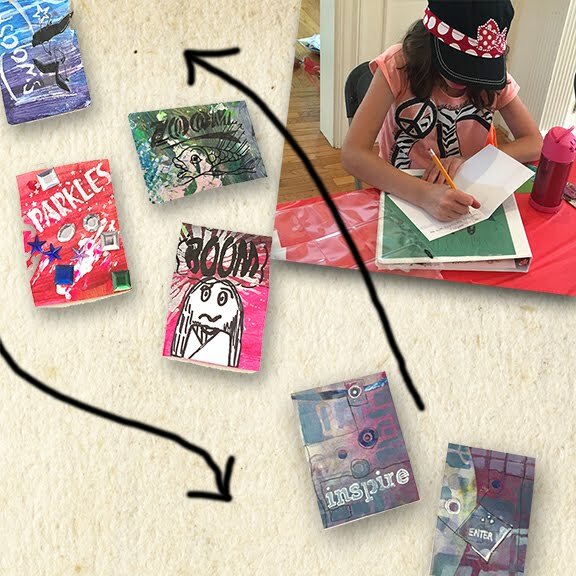 Don't forget to make art with all of the special young people in your life. Maybe if you're lucky, they'll trade with you. What a phenomenal "story"! The visual you created of the little boy who didn't want to swap was so powerful, "A Gate was opened". This particular moment in time may actually have a forever impact on him. Great job teacher of art! Thanks so much Lisa. This is definitely the biggest reward in teaching. Go for it Geri! Your grandkids will love making ATCS! 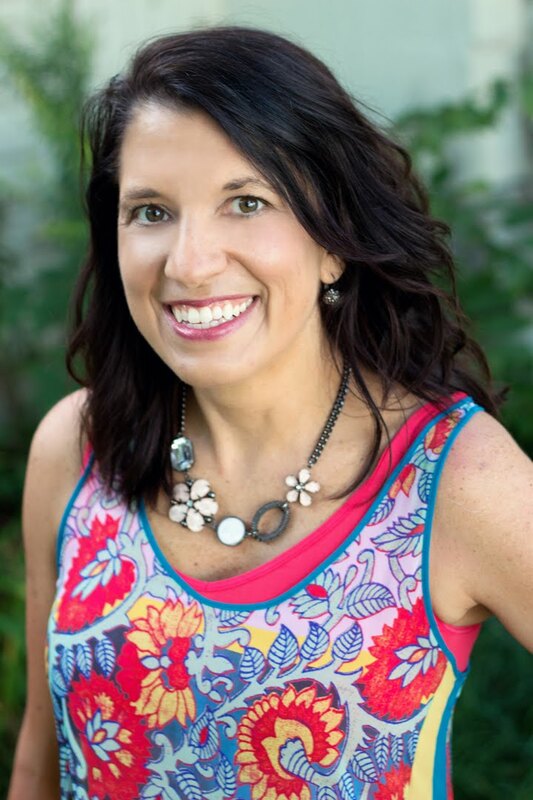 They certainly were lucky to have such a wonderful and caring counselor. Looks like everyone had a great time. ahhhh...Susan thank you! We all had a fabulous time. WOW!! What an opportunity you gave these kids! Love it all! This makes me want to host my own atc camp! Hi Anna! Thanks for your comment. ATCs make for a great camp for sure!